Transmission fluid additive ends your shift, slip, leak problems. to end your car or truck rough gear shifting, shift jerking, gear hangup, leaks, and slippage. I tell you which popular products are really harmful, to stay away from. Rough gear shifts, jerking, and gear hangup is usually caused by one or more gear parts meeting some sort of resistance. This product will correct the problem if due to friction, varnish, or a worn groove, and some part is having difficulty moving past those types of resistance, during the shift process. Shift valves, in another area, may also become pack with sludge and fail to move until enough oil pressure forces the valve to suddenly move. This sudden movement sends a torrid of fluid to that part, creating a rough shift, instead of a slow, smooth movement. This product ends that problem. A jerk may be the same friction and varnish hangup problem. Or it could be outside of the transmission, in its pump, called a lockup converter. Our remedy corrects that problem, too, as the fluid circulation must go there, from the transmission pickup screen to it, then to its various parts. Leaks: Stops seal and gasket leaks which are a result of harmful acids shrinking the seal, causing the leak. Overhaul, a $2500 plus repair, is the remedy. Many people find our under $100 remedy, a good remedy. In 90 out of 100 times it corrects the above shift and wear problems chemically, and last for many years. That is a great way to see if it ends your problem - or, at least puts it on hold from getting worst, for years. Our Guarantee: It is the fix. Or, prevents the problem from getting worst for 6 full months. That goes with my logic. Those are all problem-ending advantages - made to prevent avboidable wear problems in newer vehicles, but are promoting years more trouble free transmission life - in older and worn vehicles, by ending rough gear shifts, jerking, and gear hangup caused by some sort of resistance. The Mega Power Transmission Fluid Additive Products shown here is what you need to end your wear and tear conditions. Ordering info, the simple install procedure - and other helpful tips are covered below. Tips. On those new car transmissions with an electronic shift solonoid, its failure causes the shift problem. For that, a mechanic will check those items. Slipping. Its a good practice to use Mega Power cleaner and conditioner - the yellow product item, then remove the pan and check for and clean the filter screen. If a mechanic does this, he will look over the various colors of little piles of metal findings - [and read them for a clue, like a fortune teller does with cards, tea leaves, and throwing of bones]. Usually, those metal shavings are not significant except to tell you, some day, you'll need a $2500 overhaul. If you have a slipping problem, then friction, clogged oil passage ways, and varnish are hindering the closing of the clutches. Any clutch closing hiderance will cause slippage during the shift. It will end or not get worst maybe for a year or more with Mega Power. The fluid pick-up screen is right there where the pan civers it. It will show fiber particles worn off the clutches from excessive slippage. If you have slippage, tell me. I'll include Mega Power's Fluid Conditioner to boost fluid strength to overcome this problem.Clean or replace the screen filter. How the fix works as you drive. Simply add the product in the sequence shown below. The Mega Power Transmission Treatment cleaner and conditioner restores transmission smoothness, and ends the problem. Mega Power works during driving and gear shifting to clean, heal, smooth free, and coat to end negative conditions your transmission develops over time. And by fortifying your ATF Fluid with a Converter Conditioner [strengthener]. One, Mega Power Transmission Treatment #TS3 pictured above. Includes easy to follow directions, and my phone help if you need, during installation. Guarantee. 2-4 day delivery time. Cost $60+ $15 s&h= $75 total. 2 Treatments for 2 cars. $100 plus $15s&h= $115 total. Save $35. Six Treatments for 6 cars. For fleet or auto repair resell. $240+$20s&h= $260 Total, shipped to your door or business. 2-4 day delivery time. To order call me.... george at 1 512 665 3388. That advantage builds and maintains the strongest possible transmission fluid breakdown resistance characteristics possible - referred to as "film strength." Your transmission needs more film strength protection because... Wear creates... Friction, Heat and Acids. Your engine and transmission's biggest enemies. Heat and acids weaken your fluids resistance to keep gears, bearings, and shifting mechanisms separated. This weakness creates even more friction, more shift problems, much faster wear. Heat increases the space between oil molecules - more space means less strength and more gear-to-gear contact friction. Mega Power resolves all those fluid problems easily for you - read on. Mega Power Transmission Fluid Additive ends your shift, slip, leak problems. Shown below. Its film strength weakness grows, and more friction and sludge appear. As more grinding friction appears - the shift mechanism struggles to do the shift. Delay occurs. Or, a sudden release occurs - making the hard shift. Of course, acids will etch your transmissions shinny, new-like gear surfaces. As they touch, more friction appears and more killer heat to contend with, and faster wear out. Conditions not good for your transmission shift, or its life, of course. For those reasons, many car and equipment owners install Mega Power in their NEW, and NEWER cars, truck, tractors, and equipment as an anti-wear aid - which promotes and adds years more of like-new, trouble-free power and performance to them, than possible by just using good oils. Mega Power is what your transmission needs! Order it below. Mega Power strengthens your fluid so its film strength is stronger and more durable than even Amzoil and synthetic oil! Mega Power protection will last at least 4 years. 100% positive protection until your next service. Mega Power's MC+ ingredient ends the friction wear problem that contributes to rough shifting by re-smoothing the previously wear-roughen surface - so binding is eliminated. That benefit ends any lockup jerk friction causes in the converter around 45mph. The "lockup" feature ends slippage after 45mph - a gas saving invention. Adds what no other transmission fluid additive can - namely, metal-to-metal friction reduction. A surface conditioning to ends metal migration, the fastest, most destructive type of wear. Because ingredients include MC+ friction modifying advantages - an aid for ending rapid wear problems, the chemically smooth rubbing, rolling, and pushing surfaces will end converter jerk, friction caused problems. The converter is your transmission's hydraulic pump, that does the work of the foot-clutch and hand-shifting, non automatic car and truck drivers must use to shift gears with. See why Mega Power is a transmission anti-wear and friction modifier. One, Mega Power Transmission Treatment TS#3. Pictured above. Includes easy to follow directions, and my phone help if you need, during installation. Product Guarantee. 2-4 day delivery time by Fedex to your door. Six Treatment for 6 cars. For fleet or auto repair resell. $240+$20s&h= $260 Total, shipped to your door or business. 2-4 day delivery time. Email: megapower@grandecom.net Prompt replies always. Mail: Include your problem, product wanted, delivery, phone info. Mega Power goes where oil cannot to open plugged oil passage ways, to clean and free the shifting valves - and neutralize acids - as its contribution to restoring a smooth shift for you. These transmission fluid additive advantages help extend your transmission trouble free life for many years before repair is needed - customers tell us. Compared to what others enjoy. That is my own experience using Mega Power in over ten car and truck transmissions - and engines. All transmission additives are not treatments. An additive offers one advantage. A treatment - this Mega Power Treatment covers and cares for the whole transmission, not just one aspect - a complaint against existing products. Solvents clean well, but residues dislodged settle elsewhere. My solvent cleaning tank, in the shop has a 2 inch layer of muck that came from washing dirty parts with a solvent. Solvent based additives are what part stores and your oil change place like to sell - as profit in them is huge. Months down the road problems will occur - a common complaint. Which hold in suspension what is removed - and is drained out, not settled elsewhere in your transmission. The Mega Power Cleaner also neutralizes acids - one of 3 causes of early transmission failure. Fluid breakdown and friction are the other two problems Mega Power addresses and ends. And stops leaks in the process. Those rubberized "O" rings and this action restores and enlarges their supple nature - restoring their sealing ability and stopping any leak. Seals leak internally and contribute to rough shifting. Conditions the friction roughen rubbing surfaces - removing that cause of your problem. Is customized for your specific problem. Packaged for rough shift and leaks, or, for high mileage wear problems, shown below. Mega Power ends the problem when nothing else can. One Mega Power Transmission Treatment TS#3. Pictured above. Includes easy to follow directions, and my phone help if you need, during installation. Guarantee. 2-4 day delivery time by Fedex to your door. Add the Cleaning Conditioner to the old transmission fluid. Run or drive for 5 minutes. Move the shift lever to all gear locations. Drain the old fluid and replace with new. To the new fluid, add the friction modifier and and ATF fluid modifier. Drive and the fix ends your problem in a day of driving. - working great after just a few miles of driving - after you follow the tips in this review. Why wait and end up and need a $1500 to $3000 overhaul. This review helps you understand what help your transmission needs, and how this product works - compared to other brands. You know your transmission needs Mega Power. Shipped FedEx to your door with instructions and guarantee. Have it in your transmission ending its problem. Order it now! Transmission problems are growing. Why? From excessive friction, heat, fluid breakdown, acids. 14 million transmissions were repaired last year? - in about 100 miles - if nothing is broken, yet. What is this new transmission fluid additive? A new transmission additive treatment from Mega Power. A treatment covers and cares for the whole transmission, not just one aspect - the fault of existing products. By a specialized cleaning process that takes 5 minutes. This cleans and frees stuck or sticky valve shifting parts. Ending that cause of your problem. By smoothing and healing worn, rougher gears, bearings and such. And then by coating every transmission part with a slippery co-polymer. An anti-wear that also helps the other ingredients end problem-causing shift, jerk, slip, and leak problems. This treatment exceeds every vehicle makers service specs. Friction modifying means Mega Power fortifies ATF fluid to increase its oil film shear life - all friction modifiers do that. Acids form from sulfur in the fluid, humidity, and heat and is one cause of both friction and seal leaks. Mega Power neutralizes acids and this helps revitalizes seals and gaskets, to stop leaks. A seal and gasket conditioner expands them to stop leaks permanently. Mega Power then adds MC+, a transmission gear and bearing friction modifying. A unique smoothing and healing problem solver; ending the need to wait for a $1500 to $4000 rebuild to replace wear affected parts, ending that cause of your problem. Mega Power stops transmission metal-to-metal friction damage, heals damaged surfaces, adds anti-wear, a fluid temperature lowering benefit. 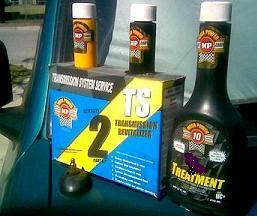 Nothing better for vehicles that tow, and for racing car transmissions. Transmission fluid additive ends your shift, slip, leak problems. Provides added protection. Mega Power transmission fluid additive secondary purpose is to prevent and avoid a costly repair expense. It does so by using special chemistry to reverse and end shift, slip, and leak problems thru a special kind of fluid conditioning and anti-wear - a chemical reconditioning of worn parts, you might say. Just add and drive. Driving does the fix in a few miles. Will this transmission fluid additive treatment end your problem? Yes! If your transmission is a more than a few years old, out of warranty, and has a rough shift, slip, shudder, leak, or slow shift problem.... read on. You might want to try this product! Me, my customers, and tens of thousands of motorist have ended those kinds of wear and performance problems with Mega Power - when other brands failed too. Mega Powers unique ingredients end problems within 100 miles of driving, and product users report many more years of trouble-free service afterwards. The odd thing is this. Many were told their transmissions needed serious repair. Many tried the Transmission fluid additive from Mega Power as a last effort before repair and were glad they did! You may want to order this Transmission fluid additive DIY product, too! End your transmission problem, maybe extend your transmission life - for years-more dependable service. Avoid wrecking your budget! I label the products on the cap T1, T2, and T3 for easy following of the directions. Item T3 is either Oil Treatment or our Stop Leak, if you have that problem. 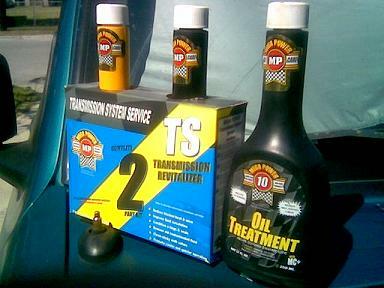 Step One: Add the MP Cleaner to your transmission fluid. Run motor and shift gears. In 5- to 10 minutes drain the fluid out and replace with new. Step Two: To the new fluid, add products T2 and T3 to the new fluid. Driving then completes the fix by ending the cause of your problem. Our customers have such a hi-rate of success with Mega Power, we guarantee your satisfaction when using it to end your problem - or your money quickly refunded. One refund requested in the last 267 days. The Mega Power Transmission Treatment, works because it does more than just clean safely - other transmissions brands clean, but they contain solvents to clean. Solvent based additives over-swell seals and make them gummy causing them to collapse over time. And solvent based additives destroy your oils lubricity - as they clean. That increases gear and bearing friction. That's no good for your transmission. To avoid those problems Mega Power transmission fluid additive uses a new penetrating detergent cleaner that is an actual transmission friction reducer and seal protector. These cleaners penetrate to the micro level to clean and free sticky shift valves - which dismantle the buildup, one cause of transmission problems. Longer life protection is added with a slippery protective MC+ co-polymer coating - which coats, fills worn-away surfaces, so every part again slides, pushes, and spins just like when new. This transmission fluid additive is for brand new and older, worn transmissions. Those are the multiple ways to add anti-wear protection for years to come. That is how to end your transmission problem now, and in the future. If you have more than 4 years on your present fluid, this treatment is the best service found to clean and protect during a transmission service. A good invention! As more friction develops on the once smooth shift pistons, valves, gears and such, more resistance to shift easily develops. Those conditions causes your problems and Mega Power ends them. Please note what other brands do on this point. Solvent Based Transmission Fluid Additives - Avoid these! Part stores, and oil changers, promote solvent-based transmission additives. Why would they do that? Solvent based additives are highly profitable - and they do clean well, but their friction increasing negatives may not show up for months. Over a few months time, you just think it time for your transmission to fail. Not so! Solvent based motor and transmission additives increase several years friction wear out in just a few months. That is what you find recommended in parts stores. Those surpy-thick, honey-like additives - like solvent based additives do some good. But, do you want to add more of a thick conditioner to your transmission already with sticky residues already causing a problem? No! Read the label, avoid solvent based and thick engine and transmission additives and stop leaks - usually the popular brands. See the "Solvents are harmful Link" at end of this review. What you want is a cleaning treatment that ends your problem - not a wear-increasing solvent treatment! Uses four special detergent cleaners. Packaged this way if rough shift, slippage, and high mileage wear is your problem. The cleaners are a treatment all by them selves - the yellow bottle in the picture. But, you need more Transmission fluid additives! There are other transmission fluid additive brands sold as a fluid modifier, however, Mega Power is the strongest fluid modifier, and reduces metal-to-metal friction, which all other transmission additives cannot do. Mega Power transmission fluid additive conditions the fluid against acid and heat damage, adding years more fluid stabilizing advantages. Mega Power transmission fluid additive is also a metal conditioner - to remove friction from power-robbing, wear roughen surface negatives, that presently absorbs power that should go to the wheels, and slow your speed down a bit more. Usually, after 15 minutes of driving, most people notice Mega Power friction reducing such, it feels like a tune up, because a bit more power is again going to the wheels, instead of being absorb by friction. Imagine that benefit! And, an anti-wear - Mega Power transmission fluid additive - the treatment, reduces friction, then coats moving parts so they again slid, pull, push, and roll freely and smoothly again, slamming the brakes on their rate of wear-out. This transmission fluid additive makes for years longer life. Those advantages are in the two other products in the picture. See "Mega Power MC+ Friction Modifier Link" at end of review. After cleaning, these two products smooth, heal, free, coat, and protect the internal valve body parts, clutches, pistons, gears and seals - going where oil cannot, to end the problem. That is the best way to protect your transmission and end its problem. With about 14 million transmissions repaired last year, at a repair cost of $1500 to $4000, its worth it to stop your problem before it runs its course - and must be overhauled to end the problem. Add the yellow bottle cleaner to the old transmission fluid. To the new fluid, add the remaining two products. Drive. Have such a hi-rate of success with Mega Power, we guarantee your satisfaction when using it to end your problem as we suggest - or your money quickly refunded. One refund requested in the last 267 days. Ordering with visa m/c ok.
One Mega Power Transmission Treatment #TS3 pictured above. These are the 3 best transmission fluid additive treatments you can buy to end your transmission problem - and prevent others.